Business Inn is multipurpose business theme suitable for business, corporate, informative, agencies, travel, blog, design, art, personal and any other creative websites. It comes with custom widgets to make user easy to develop their site without knowledge of code and design. It has one click demo import option so users can get their site ready like a demo of the theme in a single click. Business Inn is loaded with premium features to make high-quality websites of any scale. Extract business-inn.zip and upload the folder. You can change Logo, Site Title, Tagline and Site Icon (Favicon) from this option. This theme has 3 options to display logo, title and tagline. You can easily change background color of the site. This option can be use to change the background image breadcrumb section of inner pages. Note: Header image will be visible if Breadcrumb is enabled. You can go to Appearance > Customize > Theme Options > Breadcrumb Options to enable Breadcrumb of the theme. Upload or select image from media library to change background image. Go to Appearance > Customize > Theme Options. This section includes Top Header Options, Layout Options, Footer Options and Breadcrumb Options. From this section, you can enable or disable top header (bar) and manage location address, phone number or email address. This section include options to select sidebar and excerpt length. This section include options to change copyright text of the theme. This section include options to enable or disable breadcruumb. This menu will appear on top header if top bar is enabled. This menu will appear on Main menu for the site. Select the widgets or items like Search, Pages, Recent Posts, Recent Comments, Categories, Archives, Text, Calendar, etc to be added on the sidebar, homepage widget area or footer widgets area. Add these available widgets on widget area to make the awesome sites. Go to Appearance > Customize > Widget and add the widget on required widget area. This widget is to display about us section with featured image and skill progress bar. Title: This is the main title of the widget. Select Page: Content and featured image of the page selected from dropdown will be used as content and image of about us section. Image Position: Image can be aligned left or right. Show skill chart: Option to show or hide skill progress bar (chart). This widget is to display call to action button with text and background. Select Page: Content of the page selected from dropdown will be used as content CTA section. Primary Button Text: Option to add primary button text. Leave empty if you want to hide it. Primary Button URL: Option to add link of the primary button. Secondary Button Text: Option to add secondary button text. Leave empty if you want to hide it. Secondary Button URL: Option to add link of the secondary button. Background Image: Option to add parallax background image. Leave empty if you do not want to add background image. This widget is to display latest posts. 3 recent posts will be shown using this widget. Select Category: Select category if you want to show posts from specific category. Exclude Categories: Add category ID if you want to exclude post to list from any category. Excerpt Length: Option to change the number of words used in description of blog list. Read More Text: Option to add read more button text. Leave empty if you want to hide it. Hide Posted Date: Option to show or hide date of the post. This widget is to display services with image. Excerpt Length: Option to change the number of words used in description of services list. Service Page 1 to 9: Content and featured image of the page selected from dropdown will be used as services content and image/icon. This widget is to create social links in the widget area. 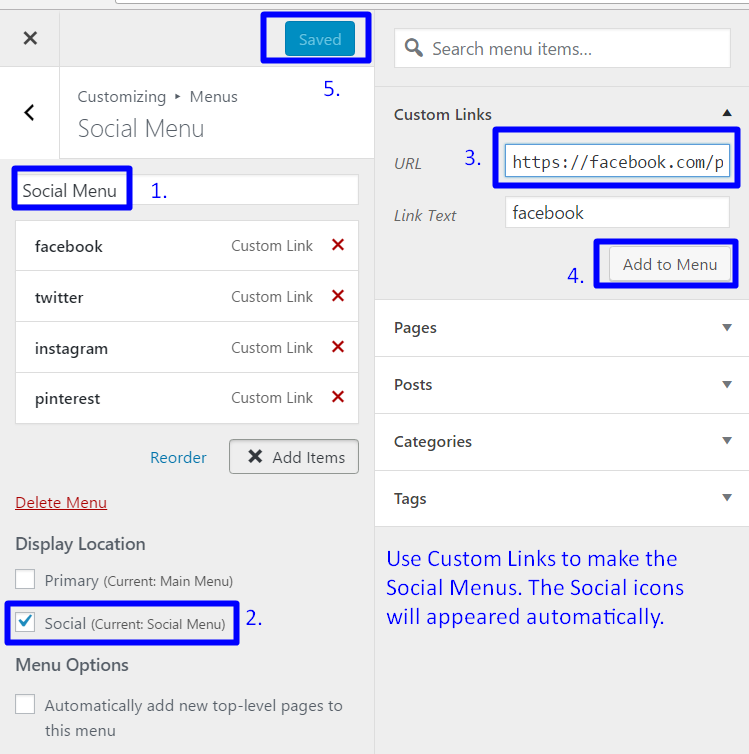 Set the social menus, that menu will appear with the help of this widget. In the above section, we have already discussed how to create the social menu. Hope, this will help to make the home page as the demo.